Silicon Valley is flush with money. So much money, in fact, that startups are looking for any excuse to disrupt industries that have existed for generations without series B funding, or capital infusions from VCs looking to get richer. We’re talking of course, about the humble pizza industry. 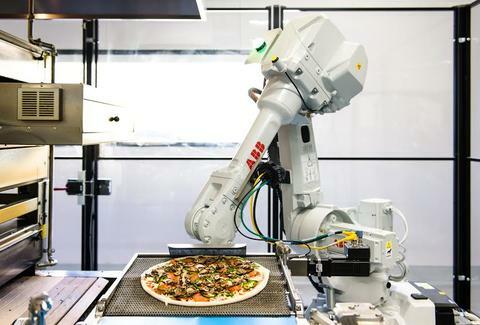 In Silicon Valley, the startup Zume Pizza is serving up pies made by robots, apparently because human labor has moved beyond the pale of mere pizza-making. Per the Associated Press, we enter Zume’s kitchen in Mountain View, California, which is crawling with robots. The bots add and spread sauce after the pizzas come down a conveyor belt. The machines then place the uncooked pies into 800 degree ovens, giving pizza the ultra-modern facelift it needs to stay relevant in 2016. “We’re going to eliminate boring, repetitive, dangerous jobs, and we’re going to free up people to do things that are higher value,” former Microsoft manager and current Zume staffer Alex Garden told the AP. But, wait. Before you assume the next Neapolitan pie you order was prepared by Bender from Futurama, listen to robotics expert Ken Goldberg, who directs UC Berkeley’s Automation Lab. For its part, Zume doesn’t plan to axe any of its human employees to make way for the automated-pizza-bots, but the idea of extravagant machines making the choice food of ironic millennials and frat boys is peak Silicon Valley, to be sure.